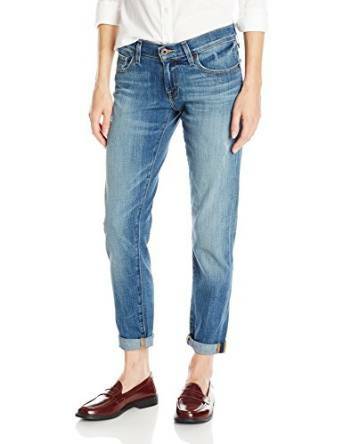 For several seasons, boyfriend jeans are not missing from any woman’s wardrobe, and this is not too difficult to understand. Any chic look I can figure includes both casual-sport, as in the trendiest outfits. You can wear the stiletto with a boyfriend shirt or a chic outfit for the office, if the job allows. 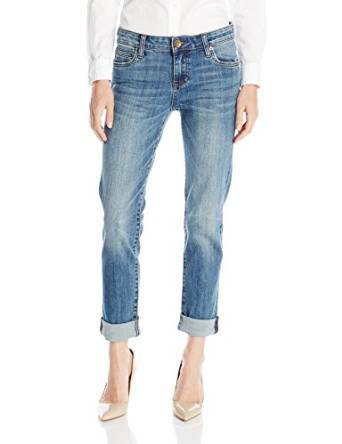 Boyfriend jeans are a relatively new occurrence. They were “born” a few years ago when Katie Holmes appeared in public wearing Tom Cruise jeans (at least that was the moment in some fashion specialists opinion…) and caused a sensation among fashionistas and designers, who immediately stepped on his feet trying to ride the wave again. The boyfriends jeans are very practical, actually they were born in that respect. Imagine an evening in which you stay with your partner without exchanging and somehow manage to dirty the jeans that you put on washing. To cover your lower body, you only have to “borrow” your friend’s jeans. Most of the time, a pair of boyfriends jeans is full of attitude, giving a male air. These are broad, and most of the time hanging on the thighs of women. But one should be very creative, so you can choose either a combination chic (combine boyfriend jeans with pieces very feminine blouses, silk sweaters wool soft and fluffy, blazers, stilettos or flats stylish purses envelope and some oversized jewelry. that way you get stylish combinations, ready for office or a smart casual look, or a combination very comfortable (when combined with T-shirts, leather jackets, sneakers or boots, suspenders and hats or caps statement. 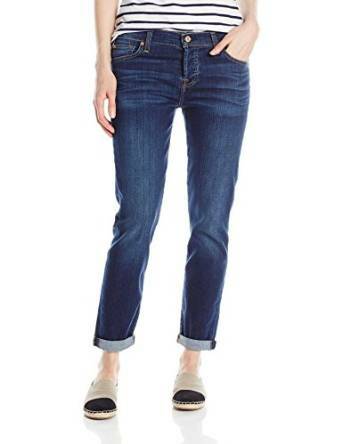 Cut and color varies depending on each fashion house, but, most often, boyfriend jeans have cuffs folded due to their length style borrowed from the male, who often do not fit woman. Sometimes, the cuffs are not only bent, but are sewn for stability, uncovering the woman’s ankle or pulp. 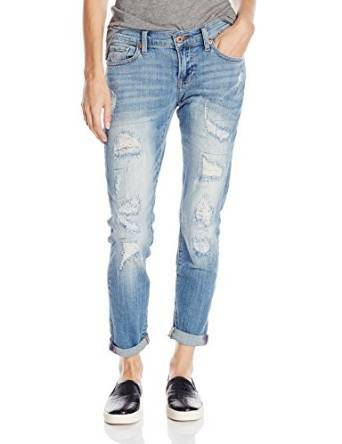 In 2013, the boyfriend jeans return to trends, this time having a modified cut, being more skinny and challenging. Boyfriend jeans versatility is also important. And because you can play easily with their length. So if you like to wear high heels, you can just let the ankle to see! When you have low shoes, espadrilles, ballet slippers or beach runs until mid-calf. You seem taller! 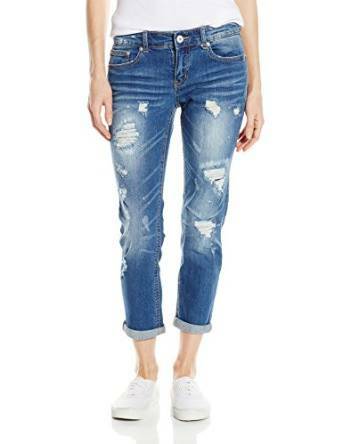 Deteriorated appearance is one of the common features of a pair of boyfriend jeans. It can contribute to your overall look relaxed. However, in order not to fall completely in the punk negligence or the ghetto, I recommend wearing boyfriend jeans with elegant pieces such as blazers, fur, silk tops and heels. 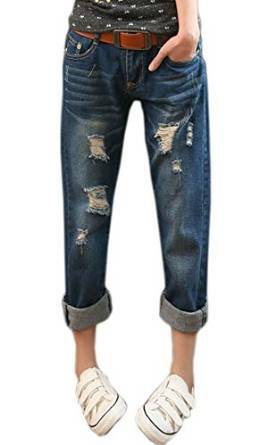 Three quarters boyfriend jeans are ideal for people with short legs, and if you have a little tummy, fear not usually this kind of pants a mask. 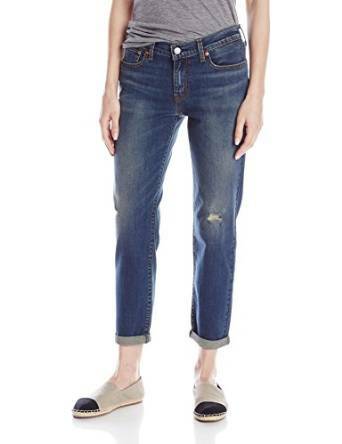 For aficionados of skinny jeans still have not left convinced that jeans boyfriend can wear and they successfully but have not given up entirely on the idea, all Adams-Geller comes with the solution: buy skinny jeans with one or two higher numbers and cut them into bottom so it looks like the boyfriend.